Control of smooth muscle is vital for health. The major route to contraction is a rise in intracellular [Ca2+], determined by the entry and efflux of Ca2+ and release and re-uptake into the sarcoplasmic reticulum (SR). We review these processes in myometrium, to better understand excitation-contraction coupling and develop strategies for preventing problematic labours. The main mechanism of elevating [Ca2+] is voltage-gated L-type channels, due to pacemaker activity, which can be modulated by agonists. The rise of [Ca2+] produces Ca-calmodulin and activates MLCK. This phosphorylates myosin and force results. Without Ca2+ entry uterine contraction fails. The Na/Ca exchanger (NCX) and plasma membrane Ca-ATPase (PMCA) remove Ca2+, with contributions of 30% and 70% respectively. Studies with PMCA-4 knockout mice show that it contributes to reducing [Ca2+] and relaxation. The SR contributes to relaxation by vectorially releasing Ca2+ to the efflux pathways, and thereby increasing their rates. Agonists binding produces IP3 which can release Ca from the SR but inhibition of SR Ca2+ release increases contractions and Ca2+ transients. It is suggested that SR Ca2+ targets K+ channels on the surface membrane and thereby feedback to inhibit excitability and contraction. The solutions to medical problems that we encounter arise from understanding the nature of the problem and enough of the associated factors to enable the development of therapy. Problems associated with smooth muscle function are no different. Already, significant advances have been made in diagnosis and treatment in this area, e.g. hypertension. However, there are still significant gaps in our knowledge and conditions such as pre-term labour and asthma remain significant clinical problems. It has long been recognised that a rise in intracellular calcium concentration ([Ca2+]i) is fundamental to smooth muscle contraction. Recent research has focussed on understanding the local and global changes in [Ca2+] that occur as a consequence of stimulation (2). In this brief review we will examine the progress that has been made in understanding these mechanisms in one particular smooth muscle _ the myometrium. Fundamental to the function of the uterus is its composition of endometrium and myometrium. The endometrium is a soft tissue bed that is designed to accept and nurture the developing conceptus, and the myometrium is a contractile outer lining, composed of smooth muscle, and responsible for the expulsion of the developed baby during childbirth. The uterus exhibits spontaneous (myogenic) contractile activity as a direct result of oscillations in [Ca2+]i, which are tightly regulated (32). Therefore, in order for us to more comprehensively understand the function of the uterus, it is necessary to study the regulation of [Ca2+]i, and its impact on uterine contractility. What are the mechanisms responsible for the increase in [Ca2+]i for uterine contraction, and how do these relate to changes in force production? Linking changes in membrane potential to changes in [Ca2+]i and force is known as "excitation-contraction coupling", or EC coupling. EC coupling starts with a depolarisation of the plasma membrane that is above the activation threshold of voltage-activated dihydropyridine-sensitive L-type Ca2+ channels (LTCC) and causes them to open. The open Ca2+ channels allow the influx of Ca2+ (down its 10,000-fold concentration gradient) that not only contributes to the further explosive depolarisation of the plasmalemma, but also binds to the Ca2+ binding protein, calmodulin (see Fig. 1). Calmodulin then forms a complex with and activates myosin light chain kinase (MLCK), which, as its name suggests, phosphorylates the myosin light chain. Myosin continually forms cross bridges with actin, and the cycling of these cross bridges is the molecular mechanism for contraction. Phosphorylation of myosin light chains increases the rate of cross bridge cycling, as the myosin ATPase is stimulated, and hence produces contraction. The vast majority of these steps can be regulated and fine tuned, by phosphorylation and dephosphorylation reactions or the binding of further accessory proteins and thus alteration of binding affinity or activity (28; 33). The regulation of these controls operates via numerous feedback loops that occur at specific times that are crucial in the regulation of the profile of the force transient and activation state (see Fig. 1). Figure 1: The link between Ca2+ entry through L-type Ca2+ channels in the plasma membrane and uterine contraction. Ca-calmodulin activates mlck (myosin light chain kinase) and myosin becomes phosphorylated, stimulating cross-bridge cycling, and hence, contraction. MLCP (MLC phosphatase) dephosphorylates myosin and thereby promotes relaxation. Its activity is inhibited by rho-A kinase (ROK) and this promotes force. The activity of MLCK can also be modulated by phosphorylation e.g. by PKA. Thin filament associated proteins, caldesmon and calponin also inhibit myosin ATPase activity but phosphorylation e.g. by MAP kinase (MAPK), reduces this inhibition. Perhaps the most critical event in the control of uterine contractile activity is the influx of Ca2+ from the extracellular space. A large proportion of recent work on smooth muscle contractility has used fluorescent dyes that exhibit a shift in excitation/emission wavelength upon binding Ca2+ to measure [Ca2+]i. In this way we have gained insight into the nature of these changes and their relation to the observed changes in force. The application of nifedipine, a specific antagonist to the LTCC, rapidly abolishes contractions (see Fig. 2A, (25)). If the myometrium is exposed to Bay K8644, an agent that increases the open probability of the LTCC channel, an increase in the frequency and strength of contractions is observed (12). Application of controlled membrane potential steps to cells under voltage clamp conditions have demonstrated that the opening of the LTCC is dependent on depolarization (Fig. 2B) _ without the changes in membrane potential, contractions do not occur. For equilibria to be maintained the smooth muscle cells must subsequently extrude the intracellular Ca2+ that it gained with depolarization, and these mechanisms will be discussed next. Ca2+ is removed from the cell interior by the operation of two proteins that span the plasmalemma: the Ca2+-ATPase (PMCA) and the Na/Ca exchanger (NCX) (14; 24; 34; see also Carafoli, this issue, ref 3a). It is the activity of these proteins that is responsible for the maintenance of the 10,000-fold concentration gradient across the plasmalemma. Differences in the properties of these proteins reveal the characteristics that define them, and are fundamental to their operation; the NCX has a lower affinity for Ca2+, but is a higher capacity system (3), whereas the PMCA extrudes Ca2+ at a lower [Ca2+]i (1). Thus PMCA may be viewed as providing a "fine tuning" of resting [Ca2+]i, and the NCX having a role in the regulation of higher, stimulatory [Ca2+]i. As its name suggests, the NCX depends upon the transplasmalemmal Na+ gradient, which is maintained by the Na+/K+ ATPase. The NCX relies upon a higher [Na+]o than [Na+]i, and can reverse, i.e. drawing Ca2+ into the cell, in the event of a reversed transplasmalemmal Na+ gradient. Although this is not considered its primary physiological role, such conditions are used experimentally, and NCX mediated Ca2+ influx can trigger Ca2+ release events from nearby SR (23). The PMCA extrudes Ca2+ at the expense of ATP and counter-transports protons (5; 19). Both the NCX and the PMCA are accompanied by accessory proteins that allow the modulation of each respective protein (22). Experimental elimination of either NCX or PMCA can provide information on their contributions to Ca2+ efflux. Both PMCA and NCX have been identified in uterine cells and investigated biochemically (8; 11). The first study to investigate the role of the two plasmalemmal Ca2+ removal systems in uterine myocytes under voltage clamp conditions was that of Shmigol et al. (24). The Ca2+ transient decay following a depolarizing pulse was compared when either or both efflux pathways were inhibited. Both efflux pathways were found to make a significant contribution to Ca2+ extrusion, with the NCX contributing up to 30% and PMCA 70%. No efflux occurred when both mechanisms were inhibited (24). As discussed later, the sarcoplasmic reticulum (SR) also contributes to the decay of the Ca2+ transient, and efflux rates. These studies on Ca2+ transients in voltage-clamped single cells illustrate the clear contribution of both plasmalemmal efflux mechanisms to the decrease in Ca2+ following stimulation. In this way Ca2+ entry and exit will be in balance across the plasma membrane, in the steady state. The next section describes recent data investigating the functional importance of the mechanisms. Figure 2: Depolarization, Ca2+ channels and Ca2+ entry. A: In an intact preparation, force and Ca2+ transients (from Indo-1 signal) are recorded during control conditions and then when the perfusate is changed to one with 0-Ca (EGTA). Note the rapid abolition of both contractions and Ca2+ transients. B: Changes in Ca2+ current and intracellular [Ca2+] produced by a depolarizing pulse in a single voltage clamped rat uterine myocyte. 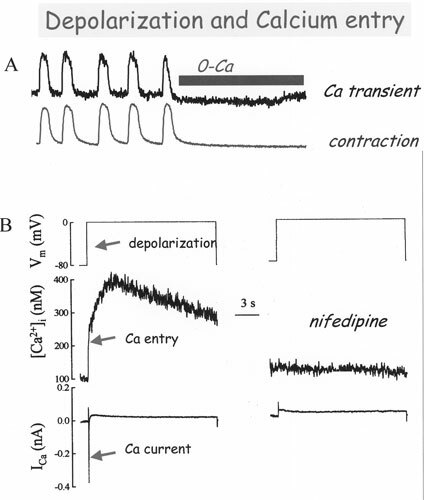 Note that blocking L-type Ca2+ channels with nifedipine abolished the Ca2+ current and rise of intracellular [Ca2+]. The lowering of intracellular Ca2+ is associated with relaxation of force. Work on myometria from mice with the PMCA isoform 4 knocked out has helped to elucidate the relative contributions that the NCX, and isoforms 1, 2 and 4 of the PMCA (the three PMCA isoforms expressed in the mouse myometrium (22)) make to relaxation, and by extension, Ca2+ efflux (17). When the uterus is in 0 Na+ solution, NCX will be inhibited. In wild-type mice this produced only around a 10% reduction in the rate of force relaxation, whereas with PMCA4 knocked out, relaxation was slowed almost 50%. Further analysis of this data suggests that normally PMCA4 contributes 70% to force reduction produced by lowering [Ca2+]i. The data obtained in this study on force production in the non-pregnant mouse myometrium are compatible with data recorded in previous studies on [Ca2+]i in pregnant rat myometria (24; 29). Taken together, despite species variation, it seems that in the myometrium the NCX accounts for approximately 15% of relaxation and 30% of Ca2+ removal, and the PMCA is responsible for the remaining 85%, and 70%, respectively. The majority of the contribution from the PMCA seems to be due to the activity of the PMCA4 (ª80% of relaxation due to PMCA activity). In the classical view of excitable cells the SR acts as a short-term Ca2+ store and redistribution vehicle, continually sequestering cytosolic Ca2+ and releasing it onto specific sites within the cell, particularly the myofilaments for contraction. Almost all intracellular SR Ca2+ release sites were thought to be stimulatory, and so the release of the intracellular Ca2+ stores caused activation of the cells' specific function. Recent work on the myometrial and vascular smooth muscle cells has shown, however, that the role of the SR is not confined to excitation (13; 29; 31). Myometrial cells have an extensive SR network, which approaches very close to the plasma membrane, and is also abundant near the nuclear envelope. The SR contains both IP3 and Ca2+ (ryanodine) gated receptors Ca2+ release channels (16) and a Ca-ATPase (SERCA) to accumulate Ca2+ (30). In the mouse, rat and human myometrium pharmacological inhibition of the SR Ca2+ pump e.g. by cyclopiazonic acid (CPA), increases contractility and Ca2+ signalling as shown in Figure 3 (12; 18; 20; 29). Clearly then, the SR cannot be acting to simply increase Ca2+ and potentiate contraction. It has been suggested that Ca2+ release from the SR modulates excitability, and thereby Ca2+ entry and contraction. Intimate links have been shown between Ca2+ release events, potassium (K+) and chloride (Cl-) currents in several smooth muscles (6; 13; 21; 27). Ca-sensitive K+ channels (KCa) and Cl- channels (ClCa) have been identified in myometrium (9; 10). Exposure to the relevant concentrations of inhibitors of Ca2+-activated K+ and Cl- channels causes a significant increase and decrease in the frequency of spontaneous contractions respectively, suggesting the involvement of these channels in the control of contractility (9; 18). Thus the SR has an inhibitory role in the myometrium, possibly stimulating KCa channels. Figure 3: Inhibition of SERCA. Cyclopiazonic acid (CPA) was used to inhibit the SR Ca-ATPase (SERCA) and remove the contribution of SR Ca2+ release to spontaneous activity, in mouse myometrium. Note that force is stimulated. There are three mechanisms for removal of Ca2+ from the cytosol; the NCX, PMCA, and the SERCA. The NCX and PMCA are both located on the plasma membrane and extrude Ca2+ to the extracellular space. The SERCA is located on the SR membrane, and pumps Ca2+ to the SR lumen, which offers a finite capacity for storage. If the SR is to lower [Ca2+]i over a longer time scale than purely on a beat-to-beat basis, there must be some mechanism by which SR lumenal Ca2+ can be lowered. This process was revealed by work on rat uterine myocytes (26), in which the rate of decay of voltage-clamp pulse induced Ca2+ transients was measured in control and compared with the rate of decay with the SR inhibited. When the SERCA was inhibited with CPA the rate of decay was slowed by 50%, showing that the SERCA was facilitating the extrusion of cytoplasmic Ca2+ (Fig. 4). However, if NCX and PMCA are blocked, SERCA alone was not able to extrude Ca2+ (see Fig. 4). This leads us to conclude that the SR is operating in series with the plasmalemmal Ca2+ extrusion mechanisms. The hypothesis was that the SERCA was bringing cytosolic Ca2+ into the SR lumen, and the SR then released its Ca2+ at regions of the SR closely opposed to the plasma membrane rich in NCX and PMCA, enhancing their ability to pump Ca2+ out of the cell. The specific sites of the plasma membrane are likely to contain higher than average densities of PMCA and NCX (7), but also may feature Ca2+-activated K+ and Cl- channels. These Ca2+-activated channels play significant roles in the continuous modulation of membrane excitability, and hence contraction frequency. In addition, Ca2+ release from the SR may contribute to agonist-induced force production (15; 29). There are a multitude of key points for the regulation of uterine function. These points of regulation are of fundamental importance to the function of the uterus, as large changes in contractile behaviour are required to accomplish the demands on the tissue at different gestational states. Numerous studies have clearly demonstrated the change in expression of specific proteins that control the contractility of the myometrium (e.g. BK channel (10), contractile activators (4)). Changes may also be expected in the expression of other proteins associated with the role of the SR, as well as in the Ca2+ efflux mechanisms. Therefore Ca2+ entry, together with SR Ca2+ release and efflux will optimise the Ca2+ transient profile to the function of the uterus. Figure 4: Contribution of efflux mechanisms to Ca2+ decline. Rat uterine myocytes were stimulated with carbachol and then the rate of decrease in [Ca2+] analysed. A: comparison of control and with plasma membrane Ca-ATPase (PMCA) inhibited with carboxyeosin and B: comparison of control and with Na+/Ca2+ exchanger (NCX) inhibited by removal of external Na+. Note both exchangers make a significant contribution to Ca2+ removal in the uterine cells. Adapted from ref (23). We are grateful to the MRC for funding this work. Received: March 18, 2004. Accepted: April 29, 2004.